FLORIDA KEYS — Bring on the dipping sauce! Starting Oct.15, stone crab claws, brought fresh to shore from Florida Keys waters, will be steamed, cracked, plated and served dipped in melted butter or a savory mustard sauce. During the seven-month-long stone crab season, hundreds of thousands of pounds of Florida’s stellar crustacean will make their way from area waters to diners across the nation who hunger for their sweet, tender meat. According to the Florida Fish and Wildlife Conservation Commission, about 40 percent of the state’s annual stone crab harvest of more than 3.1 million pounds comes from Keys waters, making this region Florida’s top supplier of the world-renowned delicacy. One of the Keys’ most treasured dishes, stone crab claws are succulent and meaty — closer in size to a 2-pound Maine lobster’s claws than a blue crab’s claws. The mouth-watering claws are typically cooked immediately after being brought to the dock, usually by placing them in salted boiling water for seven to eight minutes. The claws are then stored on ice before being transported to local markets and restaurants. Running cold water over the cooked claws keeps the meat from sticking to the shell — and Keys locals know the secret to cracking the claws open: throw out those fancy shell crackers and use the back of a spoon. Gently smack the shell and it will crack cleanly. 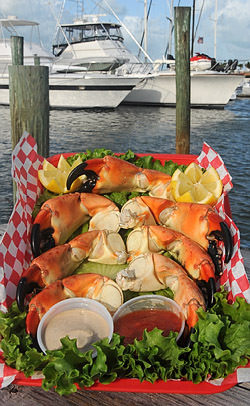 Stone crab claws are a renewable resource because the crabs can re-grow harvested claws. While both claws can be taken lawfully if each is of legal size, defined as a 2.75-inch propodus (the larger, immovable part of the claw’s pincer), harvesting only one claw is preferable for the crab’s protection and feeding ability. It is illegal to take claws from female stone crabs carrying eggs. Several restrictions apply to the recreational harvesting of stone crabs. For more stone crab information, including rules governing recreational harvesting, visit the FWC website. 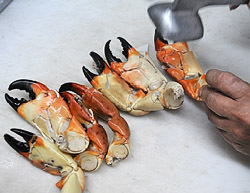 The 2011-2012 stone crab season continues through May 15. To find out about Florida Keys accommodations and restaurants during stone crab season, explore this website and…if you happen to find yourself in the Miami area, Joe’s Stone Crab restaurant is celebrating their 100th anniversary.